Isthmia is a sanctuary area located 6 mi. [10 km.] east of Corinth near, but not quite on, the shore of the Saronic Gulf. This Panhellenic sanctuary was dedicated to Posideon (god of the sea and of earthquakes). Games and music contests were held here every two years. The activities included running, boxing, wrestling, the pentathlon, and horse and chariot racing. In later times musical and poetry contests were added to the list of events. 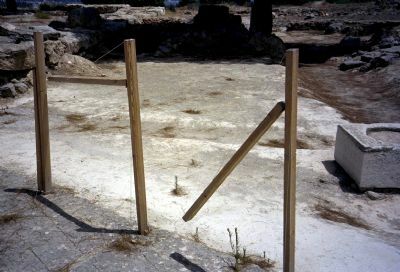 Because of its proximity to Corinth, where the apostle Paul stayed for about 18 months, some biblical scholars believe that the apostle Paul may have “picked up” some of the “athletic imagery” that he uses in his letters from these games and that as a tent maker, he may have made tents for the athletes, officials, and visitors to the games. The four Panhellenic Games were held at Olympia, Delphi, Isthmia, and Nemea.